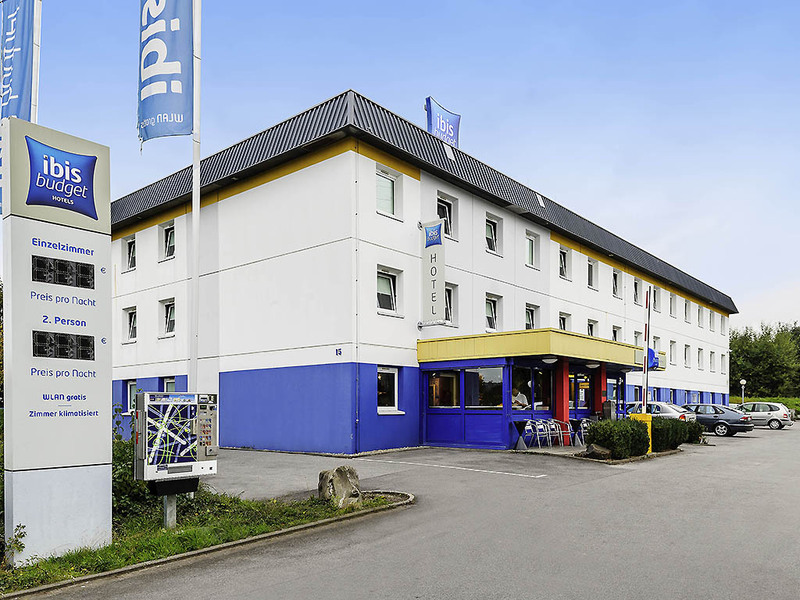 Hotel ibis budget Aachen Nord. Book online now! Free Wifi! The ibis budget Aachen Nord hotel is just 109 yards (100 m) from the A4 highway and 875 yards (800 m) from the soccer and equestrian stadium. The hotel has 78 rooms, each accommodating up to two adults and one child under the age of 12. You can surf the Internet using our WIFI access free of charge. Free parking is available at the hotel. Convenient logistics, but unexpected smoking room made sleeping uncomfortable due to smell. We liked the convenient logistics of our late arrival and the room itself, but didn't expect to get a smoking room and slept badly due to the smell. Clean, comfortable and convenient for the motorway. Slight hiccup at check-in because an inexperienced receptionist did not accept that the room was fully pre-paid. Tried to make us pay again. Nasty and dirty hotel. Bed sheets full of hair ,bad smell and disgusting colour. It met my expectations, but it always does. Good. The person on reception was pleasant and helpful. The room was clean and non-smoking. The breakfast was very good value. Basic, clean room and very friendly, helpful staff. Computer check-in didn't work properly - code given would not allow entry. Staff very helpful and accommodating. Exactly what we needed for a short break away. My experience was more than good, especially with the people running the hotel. Thank you. Convenient place to stop, near motorway. Fine stay, the cleaning this time could have been a little better and there was big bugs on the room this time. I was transiting through Germany so I booked a room at Aachen Nord with a comment that I will be arriving late around 12:30-1:00 am, which I actually did arrive at 12:30 exactly. I had my booking confirmation number ,everything seemed fine. However I reached the hotel at 12:30, there is no reception staff as this is the Ibis budget policy., just a machine, typed my code there 10 times, thought maybe I did a mistake or something, it said Reservation No not found. I figured fine, I will just make a new reservation, guess what? hotel was fully booked so I couldn't get another room either, ended up wasting 2,5 hrs afterwards looking for another hotel in Aachen at 2 am in the morning until finally I found another Ibis(lucky for your business) in the Centre of Aachen that had rooms available so I made a reservation on the go. Due to this I would certainly try to avoid Accor(Ibis) group for future reservations as I do not have 2 hours to waste so late in the night when all I need is a place to sleep. I hope I won't get charged for a reservation I couldn't use because of your mistake. Either someone forgot to keep my room, or they have a policy to sell it if I don't come till a certain time, either way I mentioned when booking I am arriving late so there is no excuse for this. Terrible experience and ruined my next day since I was very tired for what I had ahead. I even have a video to prove I was at the right hotel and was typing the right reservation code but nothing was found, in case I need it as proof. Thank you very much for "a good night's sleep"
Wanted Non smoking room, but are room smelled of smokers which wasn't very nice. Towels could be a bit bigger! Nice and clean hotel. Bed a little to hard. Easy check in as a German speaker, although non-German speakers might have problems with the German card reader even though the procedure was standard practice. Well-located just off the Autobahn, and all you need for an overnight stay without frills. Would certainly use again. Everything one expects from an Ibis Budget, including a good night's sleep, easy to navigate automatic check in, clean and functional rooms and well located properties for long distance journeys. The shower head holder was broken, this was the only problem I experienced. Really enjoyed our stay. Found it very relaxing.